Mowing Tips | Bowman's Pro Turf, LLC. I want to let you in on an industry secret. Having a dense and healthy lawn with minimal weeds begins with you! One of the simplest ways that you can begin to achieve the yard that you desire is by adjusting your mowing habits. Here are some important tips to follow that will help give you a head start this season on your lawn. I have seen too many residential lawns cut to look like a putting green. This needs to stop happening. In general, we recommend to our customers that they mow between 3 and 3.5 inches. 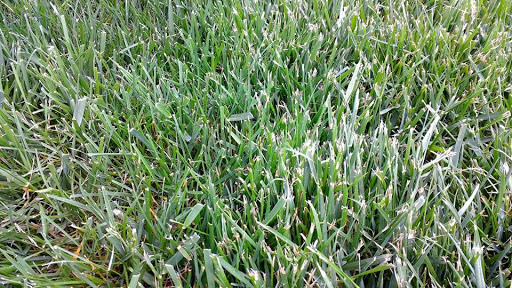 There are several reasons that mowing height affects turf health. Mowing too low is known as “scalping” and can create brown areas that are often misidentified as diseases or other non-related causes. One of the biggest benefits to a taller turf is that it allows for the plant to build a stronger and deeper root system. This root system will be beneficial for building a dense turf, maintaining turf performance during drought, and limit weed competition. When assessing the mowing height of your lawn, we suggest that you DO NOT rely on the setting of your mower alone. Start your mower and cut a small strip and check that area with a ruler or tape measure. The deck setting on mowers are just a gauge and not a true height of the cut. Even if your mower says 3 or 4 that simply is just a guide and not the actual height of the cut. It takes a long time to mow. Sometimes it is easier to let your lawn go for a few weeks until you cannot stand to look at it any longer. You go out to mow and the tall grass bogs down your mower, giant clumps of grass are left all over your lawn, and you feel exhausted. While you might think that this is only a visual eyesore for your lawn, it is a very big problem for the overall health of your lawn. The stress caused on the turf from infrequent mowing is detrimental to plant health that will allow for more weed competition. When mowing, you should never cut more than 1/3 of the blade in one mowing. If your desired mowing height is 3 inches you should be sure to mow before the grass is over 4.5 inches tall. When you mow, the cut part of the leaf will fall back to the ground and return valuable nutrients to the soil. If you bag after each mowing, you are depriving your lawn of these nutrients that promote dense growth. The same goes with in the fall when the leaves fall. While it may not look the nicest if you mulch all of the leaves in your lawn, you are doing a huge favor in providing your lawn with extra nutrients that will be needed to last through the winter. One last tip that we suggest is to sharpen mower blades often. A dull mower blade will tear the leaf of grass instead of providing a clean cut. If your blades are dull, you will notice that the top of the blade looks frayed and white or brown. A dull mower blade will result in the plant to lose more water, heal slower, and have poor aesthetics. Dull mower blades leave turf damaged and frayed. We hope that you find these tips helpful in maintaining a healthy lawn. If you have any questions feel free to call us or visit our website for more information. ← Our Commitment to Bees!